I like scotch. I like chocolate. But the idea of mixing the smokey, peaty and sometimes rough flavours of scotch with the silky, sweet, luscious, and sometimes bitter flavours of chocolate seems almost criminal. That was my initial reaction when I first heard about the pairing concept, but part of being a Foodist is having an open mind to new food experiences. After checking with “What to Drink with What You Eat” (a book about recommended beverages for food, and vice versa), I was surprised to find “dark chocolate” listed with scotch. Maybe the idea is not that crazy after all. The West Coast Chocolate Festival certainly did not think it was crazy. At 7pm on October 16, 2010 at the New Coast Coal Harbour Hotel, they set out to show just how well chocolate and scotch can go together by presenting six different pairings. They also provided appetizers, a video about scotch, and desserts (chocolate ones of course), but I’ll cut to the chase: how well can this combination possibly work? The Finlaggan is one of the most approachable scotches I’ve tried. Smokey on the nose, but much less so on the palate, and exhibiting a pleasant sweetness. If you think you don’t like scotch this one might change your mind. The Amano Ocumare chocolate and the Finlaggan got along well enough. Surprisingly the 70% chocolate seems sweeter with the scotch. 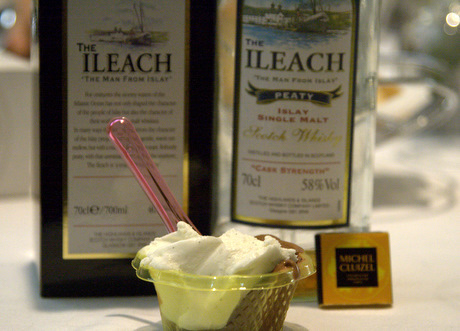 Obviously smelling of peat, the Ileach is less smokey than the Finlaggan, and oily on the nose. The palate shows some fruit and nicely pairs with the hints of blueberry in the chocolate. This is why I drink scotch. A beautiful blend of smoke and butterscotch on the nose. 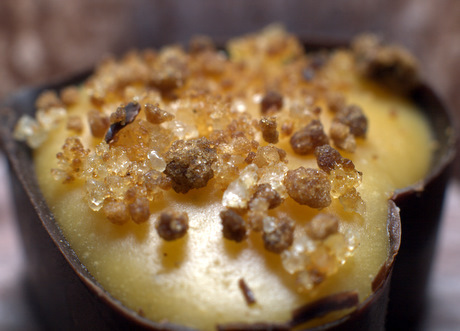 Creamy and spicy on the palate, and perfectly matched with the cardamom crème brulée chocolate. Heavenly. I liked the Tantallan so much that I’ve already purchased a bottle. Old scotches have a similar vein running through them: they cost too much. I highly recommend trying them at events like this rather than buying them blind. I’ve had a few, and this 29 year old still has bite, making it one of the better ones, but still not my style. (Many others at the event liked it the best.) The Amano Madagascar, despite being the same percentage as the earlier Venezuelan single origin, tastes more like you’d expect such a high percentage chocolate to be: smooth with bitter notes, standing up well to the scotch. Laphroaig is rather famous for being the complete opposite of an approachable scotch. You’ll love it or hate it, and generally agree that it is strong stuff. What better chocolate could there be to pair it with than the love-it-or-hate-it combination of bacon and chocolate. James Coleridge, the gelato maker and owner of Bella Gelateria, spent days creating the perfect mixture of chocolate and scotch in gelato form. This very tasty gelato proves that chocolate and scotch can compliment each other perfectly when you take the time to select the right chocolate to go with the scotch. So yes, scotch and chocolate can get along, but don’t expect inexpensive and lower percentage chocolate or milk chocolate to hold up well. 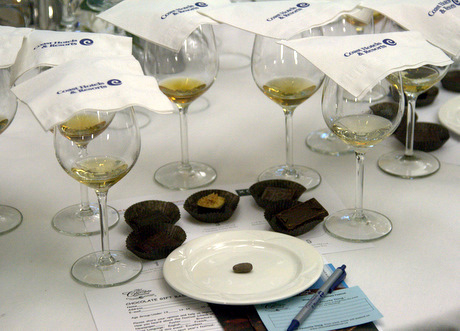 Carefully selecting premium, typically single origin, chocolate with lots of character to match the scotch is vital to the success of the pairing. 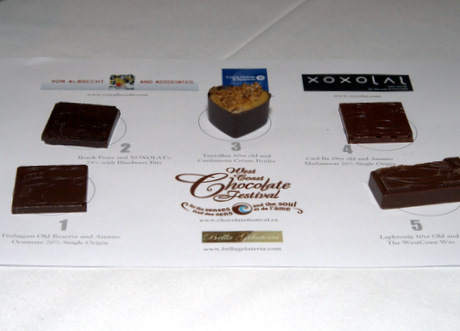 The West Coast Chocolate Festival continues until November 10. For more information see their website at http://chocolatefestival.ca. Cliff, I’d love a bottle of the Tantallan 10yr. Where can I get it and about how much is it? I made a deal with the sponsor while at the event. It is available as a spec order (BCLCB Product Number +131706 – Cases of 6). You could also contact http://vonalbrecht.com/ directly to see if they know of any stores currently carrying it by the bottle. Thanks Cliff. Went to their site. Says that the new Legacy Liquor Store in the Olympic Village carries it along with the other six of the scotches they carry. 1633 Manitoba St., Vancouver, BC V5Y 3A1. Well, I’ve been looking for an excuse to check it out and now I have one!